Fish remind me of childhood summers in Kalamazoo, Michigan. Woods Lake, just outside Kalamazoo, was a popular recreational lake dating back to the 1920s. In fact, it used to be called “Kalamazoo’s Coney Island” boasting a merry-go-round, “Dizzy Figure-8” roller coaster and a dance hall. But that was all gone by the time I arrived. Fishing on the lake was always popular; there were many kinds of fish, even giant ones, because the lake was DEEP and COLD. I spent many hours fishing there as a child (my favorite food at the time was fish sticks), and also as a teenager. I snorkeled there with my high school chum, Dave, and went sailing there, too, with beer lowered over the edge of the boat into the very cold water. While there were lots of exotic fish in Woods Lake – pike, muskellunge, largemouth bass and other sport fish, alas, there were no Lion Fish. Or were there?! I have made many fish over the years. 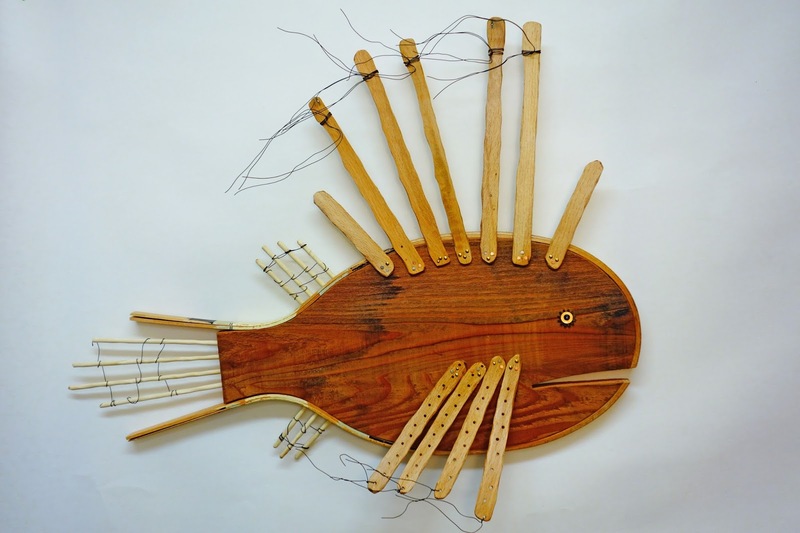 I enjoy the challenge of using recycled materials to express the simple, particular “fishiness” of each kind of fish. For the Lion Fish I used one of my favorite materials, an old tennis racket, made of beautiful white oak, that had been left too close to the elements for too long, causing it to delaminate. It made some excellent “fish sticks.” I also wanted other elements that would give this outlandish looking fish – of the “Hey, look, I’m poisonous!” variety – a lacy, gossamer quality highlighting its fluidly floating spines.